"Jonathan and his army encamped by the waters of Gennesaret." – 1 Maccabees 11:67. "And now Vespasian pitched his camp between this city and Taricheae ... all the innovators had gotten together at Taricheae, as relying upon the strength of the city, and on the lake that lay by it. This lake is called by the people of the country the Lake of Gennesareth." Tarichaea is conventionally sited north of Tiberias but it may, in fact, as Pliny writes, have been on the southern shore, possibly at Philoteria, where the lake empties into the Jordan. Capernaum. 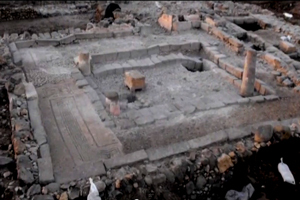 Archaeologists identified the town's synagogue in the 19th century. Before iconoclasts got to work in the 8th century, naked cupids adorned the main entrance (source) and eagles, lions, and fruit motifs decorated elsewhere (source). Though originally celebrated as the "synagogue in which Jesus taught", the structure is now recognised as no earlier than the 4th or 5th century. "We know that the site of a town’s synagogue rarely changes. Therefore it is very likely an earlier synagogue was built on this same spot and that's where Jesus taught." With the Capernaum synagogue losing much of its Jesus aura (and recent digging indicates that private houses lie under the structure), the Franciscan owners have shifted focus to what they are calling "St Peter's house" – in reality, remnants of an early Byzantine church. The 4th century church, of course, was built upon something, and that something is said to be a large private house with a plastered wall, scratched with graffiti. In those scratches, the Franciscan excavators – and gullible tourists – discern evidence of early Christian veneration, Peter the apostle, and Jesus himself. Yep, with faith all things are possible. 'Peter the helper of Rome'? So say the Franciscan excavators. "The country also that lies over against this lake has the same name of Gennesareth … it is also watered from a most fertile fountain. The people of the country call it Capharnaum. Some have thought it to be a vein of the Nile, because it produces the Coracin fish as well as that lake does which is near to Alexandria." 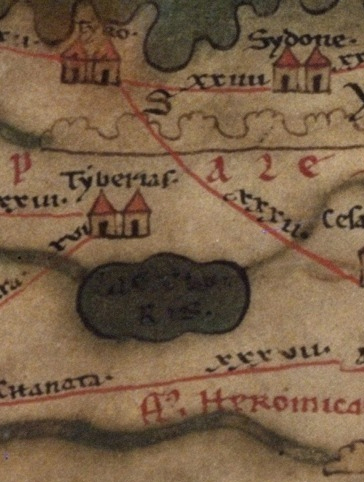 A 4th century Roman map (reproduced in the Tabula Peutingeriana) identifies Lac Tyberias – NOT "Sea of Galilee". Similarly, Eusebius of Caesarea, Onomasticon, refers to Lake Tiberias, not to the "sea of Galilee". 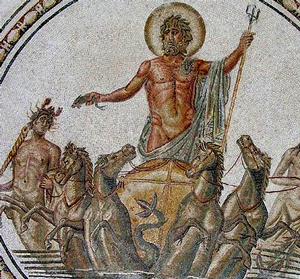 Poseidon, god of the sea, rode in a chariot drawn by four fish-tailed horses. At his approach storms would instantly cease. Another Greek prototype for water walking is found in the Iliad 24 – where the god Hermes walked on the water to reach Priam wearing his magical winged sandals. To the sons of Poseidon by human mothers, was given "the power of walking upon the water as though upon land." "Then Moses stretched out his hand over the sea; and the Lord drove the sea back by a strong east wind all night, and made the sea dry land." – Exodus 14:21-29. "Then Elijah took his mantle, and rolled it up, and struck the water, and the water was parted to the one side and to the other, till the two of them could go over on dry ground." – 2 Kings 2:8. Tabgha – Does this look like a desert to you? 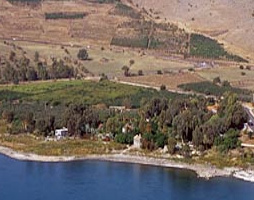 "It was perhaps inevitable that this well-watered area with its shade trees on the shore of the Sea of Galilee, where Byzantine pilgrims ate their picnics, should have been identified as the location of two episodes involving the consumption of food, the multiplication of the loaves and fishes and the conferral on Peter of the responsibility of leadership after a fish breakfast. Then it became convenient to localize the Sermon of the Mount on the small hill nearby." – Jerome Murphy-O'Connor, The Holy Land: An Oxford Archaeological Guide from Earliest Times to 1700, p. 277). Peter joins Jesus walking on the water in Matthew's upgraded edition of the Jesus fantasy. "So Peter got out of the boat and walked on the water and came to Jesus; but when he saw the wind, he was afraid, and beginning to sink he cried out, "Lord, save me." The Decapolis was a thriving region of Hellenic-Roman civilisation that divided the Jewish tetrarchies. The magnificent temples of Gerasa (Jerash) were among the finest and largest in the Roman world. The demoniac of Mark's exorcism at Gerasa (a duet in Matthew) represents the polytheistic world of the non-Jews, in thrall to "about two thousand" evil deities. Notoriously, Jesus drives this legion of demons out of the man and into a herd of pigs (innocent animals but for Jews unclean, already condemned) who commit a watery suicide. Unlike the uncomprehending disciples, the demoniac – like every non-Jew throughout the story – had recognised the "Son of the Most High God". If you feel so inclined, you can donate right now to "reliving the experience of Mary Magdalene" by donating to the Magdala Center, Israel. Kursi church ruins from 5th century. It must be the place where 2000 demon-possessed pigs leapt to their death! If you look closely along the shoreline you can see Tarichaea, Magdala, Gennesaret, Dalmanutha, Tabgha, Bethsaida-in-Galilee and Capernaum – yep, a regular metropolis! The events of the ministry of Jesus pivot around a shallow Levantine lake. In the 1st century AD the lake was smaller and shallower (by several metres) than it is today. Two thriving Romano-Hellenic cities were on its eastern shore, Hippos and Julias. On the western shore were the predominantly Jewish cities of Taricheae and Tiberias, the capital of Galilee. Not one of these cities gets a mention in the fable of Jesus. In contrast, certain supposed cities on the short northern shore of the lake (all within one hour's walk) were the hub about which the Jesus story revolved. The original story teller, the author of Mark, not only created a religious fiction, designed to salvage something from the wreckage of Judaism: he set his fable in an imaginary landscape, one that only approximated to a true topography. But belief, held with dogmatic certainty, can fashion its own reality. Rather like fans of the Wizard of Oz might locate the Emerald City somewhere on a map of Kansas, later Christians would overlay their Jesus fable on the Palestinian landscape, building churches, erecting shrines and renaming older towns to give physical form to a terrain that hitherto had existed only in a religious fantasy. Life imitated art, the land became holy, and in the process, the truth got buried. The author the Gospel of John explains to his readers that "After these things, Jesus went over the Sea of Galilee, which is the Sea of Tiberias." (John 6.1). 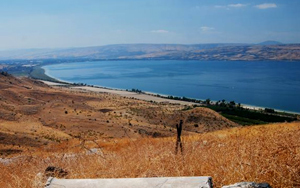 The statement was an admission that "Sea of Galilee" needed an explanation for it was a newfangled way of referring not to a sea but to a lake, Lake Tiberias. 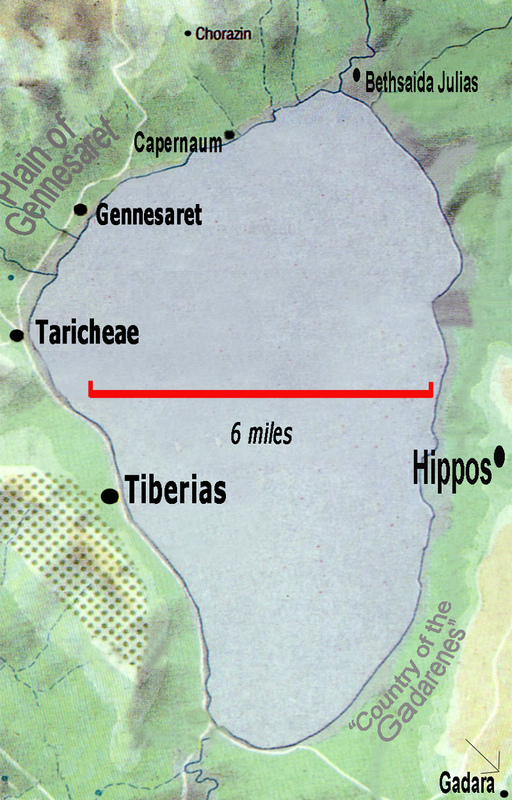 "… a lake, which many call Genesara, which is sixteen miles long and six broad. This is environed with beautiful towns: on the east side with Julias and Hippos; on the south with Tarichea, by which name the lake is by some called; and on the west with Tiberias, a healthful place on account of the hot waters." – Pliny, Natural History, 5.15. In the war against Rome, Taricheae, with its large Jewish population, was chosen by Josephus, commander of the rebels in Galilee, as a rallying point for his forces. Besieged by Titus, Tarichaea fell to the Romans and was all but destroyed. Thus it was that Tiberias, the lake side capital founded by Herod Antipas early in the 1st century and named in honour of his Roman patron, Emperor Tiberius, gave the lake its most enduring identity. Roman and Byzantine writers – Christians included – would continue to refer to Lake Tiberias for centuries. Matthew copied Mark's innovative "Sea of Galilee" (they each used the term just twice) but Luke avoided the new name entirely, preferring the traditional "Lake of Gennesaret" (Luke 5.1). Even to Eusebius, 4th century bishop of Caesarea, the expanse of water remained Lake Tiberias. The label "Sea of Galilee" gained currency only when Byzantine Christians settled around the lake in the 6th century. 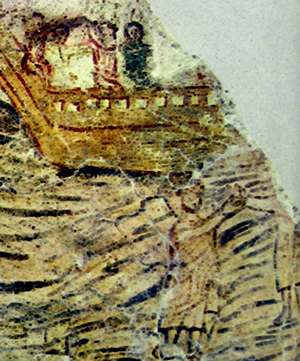 The simple truth was that the "Sea of Galilee" – a lake that can be crossed by canoe in a couple of hours – was a literary invention by the author of Mark, a fictional tempestuous sea upon which his hero could "take voyage" and, in the process, master the elemental forces, and about which he could perambulate, enthralling multitudes of Jews and Gentiles. View across the "Sea of Galilee," from the site of Hippos looking west towards Tiberias. The lake is subject to occasional squalls – Cape Hatteras it is not. From at least the 1st century BC, there were a number of small, Jewish villages on the shore of Lake Tiberias. One of them, Capernaum was the purported hometown of Jesus. Capernaum (from Kfar Nahum, "Nahum's village") is today an archaeological/tourist site divided between two rival Christian enterprises, the Greek Orthodox and the Franciscan Catholics. The ancient Jewish settlement disappeared more than a thousand years ago. Josephus confirms the sometime existence of "a village named Cepharnome, or Capernaum" (Life, 72) – but not, however, any local worker of wonders called Jesus! Matthew adds to Mark's text a characteristic "fulfilled prophecy" to explain why Jesus left Nazareth and settled in Capernaum: apparently it was in order to be a light to the "Land of Zebulun and Naphtali" spoken of by Isaiah (Matthew 4:13-16, quoting Isaiah 9.1-2). However, not only was this ancient name for Galilee anachronistic by several centuries but the site of Nazareth was itself in the "Land of Zebulun and Naphtali" so here was no explanation at all! In the earliest stage of the gospel story's development, Jesus the Nazarene (as he was originally named by Mark, 1.24, etc.) was not yet a resident of any "Nazara". That came later. It was at Capernaum where Jesus had "his house" (Mark 2.15), called his first disciples – Peter, Andrew, James, John and Matthew – established a reputation as an exorcist, and where he first performed a whole variety of miraculous healings. Mark writes of the exorcism of a demon-possessed man (1.21-28); of the healing of Peter's mother-in-law (1.29-31); of many who were healed of various diseases (1.34); of a paralytic, lowered through the roof (2.1-12); of a man with a withered hand (3.1,5); of the daughter of Jairus, a ruler of the synagogue (5.22-24;35-43); and of a woman who had bled for twelve years (5.25,34). All these wonders occur at Capernaum. To these Matthew added the servant of a centurion (Matthew 8.5-13), a remarkable Roman officer ("of greater faith than all Israel") that Luke promoted into a Jew-friendly builder of the local synagogue ("for he loves our people, and it is he who built our synagogue for us"! (7.5). In Matthew's version of the holy story, Capernaum was even identified as Jesus's "own city" (9.1) and had a customs house. Yet for all this razzle dazzle the whole "mission" to Capernaum ended in failure! "And he could do no miracle there except that he laid his hands on a few sick people and healed them. And he marvelled because of their unbelief. And he was going around the villages teaching." – Mark 6.5-6. Conventional wisdom says that this rejection occurred at Nazareth but, in fact, Mark nowhere in his narration of the Galilean ministry (1.14-10.1) mentions Nazareth. That name was interpolated back into his text once "Nazareth" had been established by a later writer. 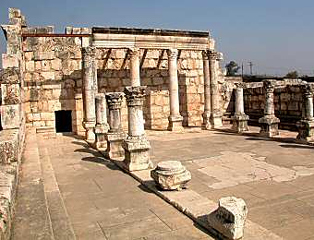 Capernaum, however, is named by Mark three times, and its synagogue is mentioned six times. In fact, it is only Luke that identifies the town as Nazareth. 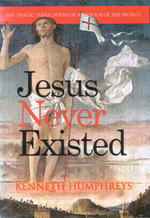 What becomes clear is that in the earliest version of the Jesus tale, that is, before the nativity sequences were added and the "city of Nazareth" conjured from the ether, Jesus would have been a native son of Capernaum – that is, but for the fact that he never existed! "And you, Capernaum, who are exalted to heaven, will be brought down to Hades; for if the mighty works which were done in you had been done in Sodom, it would have remained until this day. But I say to you that it shall be more tolerable for the land of Sodom in the day of judgment than for you." Note that Nazareth is NOT cursed, even though it was, supposedly, at Nazareth and not Capernaum that they "were filled with wrath. And they rose up and put him out of the city, and led him to the brow of the hill on which their city was built, that they might throw him down headlong." (Luke 4.28,29). Note also the characteristic manner in which Jesus condemns the entire town – no ifs or buts with this guy. Jesus is a figure of summary judgement and astonishing lack of discernment. And if local residents at the time, an audience to his awesome words and witness to his mighty deeds, were having none of it, then why should you?! The Jesus landscape requires not just a sea but a desert, a mountain, and coastal "cities", where Jesus performed "great works" before an audience of many thousands. 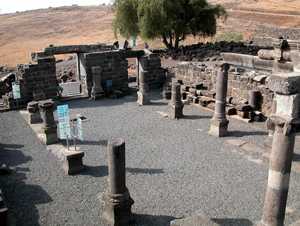 Named venues, besides Capernaum, include neighbouring Chorazin and Bethsaida. A sliver of lake side real estate, barely five miles end to end, was the very focus of Jesus's Galilean mission. Set back above Capernaum, and a tiny settlement in the 1st century AD, Chorazin was an embellishment to the story from Matthew. The hamlet grew after the migration of Jews from the south following the defeat of the Bar Kochbar rebellion in 135 – which may be the reason why the village first appears in Matthew's revised Jesus story. Apparently, (unspecified) "mighty works" had been done there but the village folk just weren't impressed! Chorazin, with Capernaum and Bethsaida, had the misfortune to be cursed by Jesus (Matthew 11.21; Luke 10.13). The village acquired a synagogue during the 2nd or 3rd century but by the 4th century Chorazin was in ruins. A tiny Arab settlement, Khirbat Karraza, was cleared from the site in 1948. One particular Beth'saida ("house of the fisherman") has been identified, not far from Chorazin but on the eastern side of the Jordan. About a mile north of Lake Tiberias, the site (aset-Tell) has a history spanning several centuries. It was once Geshur, chief city of the "Geshurite kingdom" – at least, that is, according to Jewish scripture. But by the time the gospels were written, the town was actually in the Roman province of Syria – and its name was Julias. "Philip ... advanced the village Bethsaids, situate at the lake of Gennesareth, unto the dignity of a city, both by the number of inhabitants it contained, and its other grandeur, and called it by the name of Julias, the same name with Caesar's daughter." Philip (half-brother to Antipas) ruled the tetrarchy of Iturea-Trachonitis, the land north and east of Lake Tiberias, until his death at Julias in 34 AD. With no sons to succeed him, Emperor Tiberius added his principality and its capital of Julias to the province of Syria. A single Jesus incident occurs at Bethsaida, the healing of a blind man (Mark 8.22,26). It was quite a palaver. First Jesus has to lead the man by the hand out of town. Then he put spit on his eyes, and then his hands. But the man could only see trees. So Jesus had to try again. Finally the man could see clearly. No wonder the other evangelists dropped the story – what sort of divine power was that? For Matthew and Luke spit was not a part of the Jesus repertoire, though John used spittle patties once, at Siloam (John 9.6.). "On that day, when evening had come, he said to them, "Let us go across to the other side." And leaving the crowd behind, they took him with them in the boat, just as he was. Other boats were with him. A great storm of wind arose, and the waves beat into the boat, so that the boat was already being swamped. But he was in the stern, asleep on the cushion; and they woke him up and said to him, "Teacher, do you not care that we are perishing?" They came to the other side of the sea, to the country of the Gerasenes." – Mark 4:35-41; 5.1. 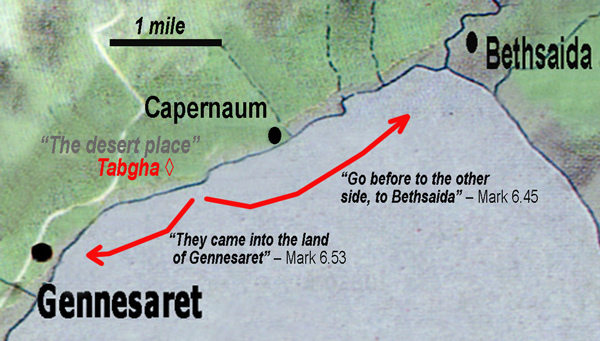 Matthew was aware of Mark's gross error of geography: the reference to Gerasa (Jerash), which was more than forty miles from Lake Tiberias. In his revision, Matthew switched to "country of the Gadarenes". 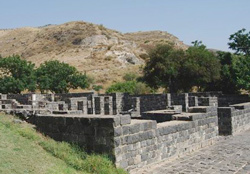 But even Gadara (Umm Qais) was eight miles from the lake (and south of the Yarmuk river)! Both Jerash and Gadara were cities of the Decapolis, a Hellenised region east and south of Lake Tiberias and inhabited mainly by non-Jews. They certainly had pigs, tombs, and probably a few madmen. Unfortunately, neither venue fitted the gospel tale. As a result, vexed scribes sometimes amended Matthew to read "country of the Gergesenes", a scribal invention that disguised the problem by ambiguity. Was "Gerges" somewhere east of the lake? That same ambiguity is found in Luke, with variants of Gerasenes, Gadarenes, and Gergesenes. Only the writers of the gospel of John found the perfect solution – they omitted the piggy story entirely! To square the circle today, apologists (and Israeli tourism) suggest that the miracle in fact occurred at Kersa (Kursi), north of Hippos, on the eastern shore of the lake. Here Byzantine Christians built a church on a hill overlooking the lake, suitable for pigs to commit mass suicide. The enigmatic "coasts of the Gergesenes" had been materialized in the 5th century religious imagination. What could be more convincing proof of a divine miracle than that! Arch of Hadrian at Jerash, visited by the emperor in 129/130. Gerasa – Jerash – certainly existed and has left magnificent ruins to prove it! It is more than 40 miles from Lake Tiberias – quite a run, even for suicidal pigs. View from Gadara, looking west to the Sea of Galilee. Gadara, a Romano-Hellenic city badly damaged in the Jewish war, was subsequently rebuilt as a Roman garrison town. 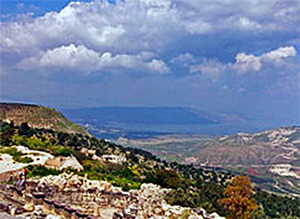 Gadara is south of the Yarmuk river and 8 miles from Lake Tiberias. "They had no leisure so much as to eat. And they departed into a desert place by ship privately." – Mark 6.31,32. "Immediately he constrained his disciples to go into the boat, and to go before to the other side, to Bethsaida, till he may let the multitude away, and having taken leave of them, he went away to the mountain to pray." – Mark 6.45-46. Jesus, who hitherto had been unable to escape the crushing crowds, is now able to dismiss them all and go up a mountain to pray in solitude! This absurdity is then compounded by the more famous one: he returns home on foot, walking on the water. Not only does he catch up with the disciples in their boat (perhaps he flew up and down that mountain? ), he would have overtaken them! "And he saw that they were making headway painfully, for the wind was against them. And about the fourth watch of the night he came to them, walking on the sea. he meant to pass by them, but when they saw him walking on the sea they thought it was a ghost, and cried out; for they all saw him, and were terrified." – Mark 6.48-50. Notice also the time: it is "about the fourth watch of the night". Have they been "at sea" for more than nine hours? Are they so close to the shore that Jesus has no difficulty seeing them – or does he not only have Superman's power of flight but also his "X-ray" vision? Notice there is a briefly stated second "calming of the storm" miracle tucked into this story, probably the kernel for the fisherman's tale that eventually found its way into Mark 4. "He spoke to them and said, 'Take heart, it is I; have no fear.' And he got into the boat with them and the wind ceased. And they were utterly astounded." – Mark 6.50-51. "And when they had passed over, they came into the land of Gennesaret, and drew to the shore." - Mark 6.53. Oops! Had they sailed east to Bethsaida or west to Gennesaret? "Desert place" or picnic area? Mark's location of that "desert place" for the bread and fish miracle is a lulu. It conjures up visions of the Judean wilderness but, supposedly, we are in Galilee and close to a very bountiful lake. Christians have ("by tradition") long identified a spot known today as Tabgha for the fish supper. To the Greeks it was Heptapegon, named for its seven springs. 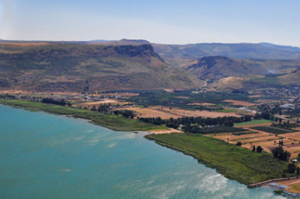 Located about half way between Capernaum and Gennesaret, this part of the coastal plain was described by Josephus in some detail – and it was one of the most fertile areas of the entire region! "The country also that lies over against this lake hath the same name of Gennesareth; its nature is wonderful as well as its beauty; its soil is so fruitful that all sorts of trees can grow upon it ... particularly walnuts, which require the coldest air, flourish there in vast plenty; there are palm trees also, which grow best in hot air; fig trees also and olives grow near them, which yet require an air that is more temperate. One may call this place the ambition of nature ... it not only nourishes different sorts of autumnal fruit beyond men's expectation, but preserves them a great while; it supplies men with the principal fruits, with grapes and figs continually, during ten months of the year and the rest of the fruits as they become ripe together through the whole year." – Josephus, Wars 3.10. Translators of the gospels have wracked their brains to smooth away this particular bunion: the place becomes deserted, desolate, solitary, secluded, etc. But however we might render the Greek (ἔρημον τόπον) – the authors of John's gospel opt for "mountain"! (6.3) – nothing can disguise the fact that our hungry multitude were sitting in a well-watered orchard! Matthew – as much as modern apologists – saw the problems with Mark's text and resolved them as best he could (Matthew 14.13-34). For a start, he links Jesus' retreat to the desert place to receiving news of the death of John the Baptist (not a lack of leisure to eat!) and he has Jesus take his quiet time alone: "He departed from there by boat to a deserted place by himself." The discontinuity between the fate of John and the perambulations of Jesus is removed and the story flows better. The crowds follow Jesus on foot but they don't illogically run ahead. After feeding the 5000, Jesus instructs his disciples to go "to the other side", but he sensibly omits the embarrassing reference to Bethsaida. Jesus still goes up that mountain but Matthew rationalises that, by the fourth watch, the disciples's boat was "now in the middle of the sea" (14.24). Jesus "went to them" by walking on the water – and this time there is no suggestion of passing them by. Characteristically, Matthew beefs up the miraculous: Peter joins Jesus walking on the water, even though the storm still rages until they both climb back into the boat! Mark's gospel has no "Sermon of the Mount" but this chunk of material is Matthew's major contribution, all 2,500 words of it (Matthew 5.1-7.29). Jesus, as the new Moses, required a "mountain" for delivering his new commandments but what mountain was that? Today, the fictitious event is "commemorated" by a Church of the Mount of Beatitudes actually sited on a small hillock not far from the lake! Mountain it is not. No wonder Luke tossed out Matthew's lunacy and introduced a note of realism: "He came down with them and stood on a level place, with a great crowd of his disciples and a great multitude of people ..." A level place? Now that sounds more like "history"! Luke omits the entire "walking on the water" episode, perhaps painfully aware that the miraculous here owes rather too much to pagan tales of Poseidon, Hermes, etc. Interestingly though, Luke "clarifies" that the desert place to which the apostles initially retreated was "belonging to the city called Bethsaida" (Luke 9.10.) – an unfortunate clarification for future generations of the faithful, trying hard to fix the theological landscape onto the real topography. If the desert place was "belonging to" Bethsaida how could it also be "on the other side" from Bethsaida? Scripture could not be wrong, so there had to be another Bethsaida, a Bethsaida-in-Galilee, and this place has to be fitted into that rather crowded waterfront along with Tarichaea, Magdala, Dalmanutha, and Capernaum! In Luke's edit, the feeding of the 5000 follows, but Luke sensibly omits the repeat performance (feeding of the 4000), presented in Mark and copied by Matthew. The Gospel of John, in keeping with its majestic pretensions for Jesus, introduces an element all of its own: Jesus knows that the 5000 men, having seen "the sign" of his fast food in the desert, intend to "take him by force that they may make him king"! (John 6.15.) The supernatural prescience invoked by John provides a more potent reason for the retreat of Jesus onto the mountain, better than Mark and Matthew's "solitary prayer". And no longer does Jesus dismiss the multitude, he merely evades them – all 5000 pairs of eyes that had so intently followed him from the "other side"! Another original element from John: the feeding is given a season. "Now the Passover, the feast of the Jews, was at hand" (John 6.4). This is but one part of John's drastic rescheduling of Jesus' one-year itinerary into a three-year mission. The final resolution of John's version of the water walk substitutes Capernaum for Gennesaret as the point of return, a village so close to Bethsaida that one might question the sanity of fishermen who take to sea on a stormy night to reach a place they could walk to in thirty minutes! Bizarrely, the wind isn't calmed (and doesn't need to be): as soon as Jesus is on board, they arrive! "And when evening was now come, his disciples went down unto the sea, And entered into a ship, and went over the sea toward Capernaum. And it was now dark, and Jesus was not come to them ... When they had rowed about three or four miles, they saw Jesus walking on the sea and drawing near to the boat ... Then they were glad to take him into the boat, and immediately the boat was at the land to which they were going." Could it be that Jesus was paddling along the shoreline? The writer of Mark enjoyed the feeding miracle so much he repeated the tale a page or two later, and in almost identical words. A common scholarly view is that Mark had to hand "two traditions" of a single miracle and used them both. Conservatives will hold out for two, albeit similar, events, siting a second "desert place" on the eastern shore of the lake. Either way, we are dealing with geographical nonsense. Feeding the 5000 followed the return of the twelve (sent out "two by two") from a test run of demon-expulsion powers. Feeding of the 4000 followed return from the region of Tyre and Sidon and another demon-expulsion episode. In version 1, Jesus has compassion because "they were like sheep without a shepherd"; in version 2, Jesus has compassion because "after three days they are hungry". The structure of the miracle itself is identical: Q. and A. with the disciples about feeding; Q. and A. about "how many loaves?" The food is multiplied, "set before" the multitude, all are "satisfied" and they "took up baskets full" of leftovers! And just where did those baskets come from – did the multitude bring baskets but no food? Bizarrely, the disciples of episode 2 remember nothing of episode 1 and ask the dumb question "How can one feed these men with bread here in the desert?" And these guys were hand-picked by Jesus?! And let's not forget: wherever the "desert place" may have been, it was never more than one hour's walk from a city! Mark offered yet another invention, "Dalmanutha," as the place Jesus sailed to after miraculously feeding 4,000 people. "And immediately he got into the boat with his disciples and went to the district of Dalmanutha." Yet Dalmanutha, is completely unattested in other ancient sources and has never been identified. Mark's reference to "Mary the Magdalene" (15.44) was the prompt for the later evangelist Matthew to insinuate yet another imaginary town on the lake shore – Magdala or "Magadan". Luke was unpersuaded by this and stayed closer to Mark, with "Mary called Magdalene" (Luke 8.2). But the invention allowed Matthew to replace the Markan fiction with one of his own, "the coasts of Magadan." "After sending away the crowds, he got into the boat and went to the region of Magadan." Defenders of the faith have attempted to identify this Magadan with Magdala Nunayya, known from the Talmud and with the real city of Tarichaea. Given a possible derivation from migdal (tower) and the commonality of such towers, a single locale, Tarichaea, which had a tower (and actually took its name from the salting of fish) is simultaneously identified as Tarichaea, Dalmanutha, Magadan and Magdala! Not bad for one minor settlement. Some recent (September 2013) ballyhoo that "Dalmanutha had been found" (hey, Christmas is just around the corner) predictably glossed over the lack of any link to an identified town in antiquity. The recent finds are barely one city block from debris already identified as Magdala. In other words, all the evidence is of the Jewish-Hellenistic town of Tarichaea, once extending along the shore but destroyed by the Romans in 68. Even the 1st century synagogue identified here in 2009 has Roman-style frescoes of colored panels and mosaic floors. One Biblical scholar (Watts) has suggested that "Dalmanutha" may actually mean "the place of widowhood" and thus be a cryptic reference to Vespasian's massacre (Wars, 3.532-5). Only faith (and a certain amount of commercial nous) justifies imposing the literary dreamscape of the gospel writers onto the reality dug from the ground. "And immediately he got into the boat with his disciples and went to the district of Dalmanutha. The Pharisees came and began to argue with him, asking him for a sign from heaven, to test him. And he sighed deeply in his spirit and said, "Why does this generation ask for a sign? Truly I tell you, no sign will be given to this generation." And he left them, and getting into the boat again, he went across to the other side ...They came to Bethsaida." On voyage to Bethsaida, a lesson ensues on the meaning of "bread" ("Watch out – beware of the yeast of the Pharisees and the yeast of Herod." ) The disciples, handpicked by Jesus to lead his evangelical crusade, and witnesses to not one but two mass feedings, still "fail to see ... fail to hear" (Mark 10.18). That of course, is precisely why two miracles – one of a deaf and dumb man, one of a blind man – appear like book ends around the entire scene: they are designed to demonstrate: "He makes both the deaf to hear, and the dumb to speak." None of this is history, it is fictionalised theology. "And in Capernaum, what is more, the house of the prince of the apostles has been turned into a church, leaving its original walls however quite unchanged." The Empress Helena, mother of Constantine, set an example and provided the largesse. Shortly before her death in 330, she entered the land "where Jesus had trod" in order to take possession of talismanic mementos of the new god. She returned to Constantinople with tangible evidence of the divine favour that protected the imperial household, notably nails from the true cross. Locally, the bishop of Jerusalem, Macarius, had effectively won the lottery, sanctioned by Constantine himself to demolish the edifices of paganism and build a great church with "no expense spared." But what of the hinterland of Palestine, particularly the Galilee, with its mixed population of Jews and pagans, and very few Christians? Seizing the opportunity was a Jewish entrepreneur, and, of necessity, a convert to Christianity, Joseph of Tiberias. This erstwhile member of the Sanhedrin convinced the new master of the Roman world that his religious revolution would benefit enormously if the glorious passage of Christ through the land of the Jews were to be commemorated with suitable trophies and churches that would both strengthen the faith of pilgrims, following in the steps of his mother, and draw in converts to Christianity from the Jews and heathens. Joseph must have been no less adept at convincing his former co-religionists of the lucrative business opportunity that Constantine's conversion had presented. The Jews were not yet the pariahs they would become and Christian pilgrims needed guides, accommodation and sustenance. They would enthusiastically avail themselves of every available memento that had been sanctified by the holy presence. Thus it was that Joseph, raised to the rank of count by an appreciative emperor, built a church for pilgrims at Capernaum, within the shadow of the synagogue itself. At Tiberias, a part of the neglected temple of Hadrian became a church to the apostles James and John, whose house was conveniently found to lie beneath the imperial sanctuary. At Nazareth, Joseph constructed a "House of Mary" church. At Migdol, it was, of course, the home of Mary Magdalene that was so honoured. It seems that even Simon Magus, the great heresiarch, had his purported residence at Sepphoris (Diocaesarea), sanctified as a house church. Once a Jesus-venue had been selected, fame and veneration grew. At Capernaum the church was given an association with the apostle Peter – and pilgrims, like Egeria, in the 4th and 5th centuries scratched graffiti into the walls, thus themselves providing the only "evidence" of an apostolic connection. The circle was complete. It is not only the characters of the gospel story that had no real existence. Even the very places of Jesus's mighty deeds are mere fictitious overlays on the true geography. At times, the locales appear to conform to reality, but for the authors of the drama geographic veracity was no more important than historical veracity. The message of their tale was of a "higher truth" than mere worldly accuracy. But to those who came later, who wanted to believe the myth or encourage others to do so, superimposing the imaginary world onto the real topography was important. The fabrication of a Christian holy land, that began with the Empress Helena and Joseph of Tiberias seventeen centuries ago, continues today, fuelled by evangelical zeal and mass tourism. Faith and "tradition" – and now 21st century showmanship – continue to actualize the dream, and for many, fake or real, does it really matter? Flavius Josephus, Wars of the Jews. A Jesus miracle at Siloam? – Recycled "sacred space" !